The Northwest Passage remains one of the most remote and inhospitable regions of the globe and has until recently been virtually impassable, with the sea frozen for much of the year. Since Norwegian explorer Roald Amundsen first completed the journey in 1906 there have been fewer than 160 crossings, but with the retreat of the ice pack due to global warming, the route is becoming increasingly navigable. It was the isolation and exclusivity that inspired Captain James Pizzaruso and the owner of the 36 metre gentleman's explorer yacht Arcadia to plan their own adventure  originally scheduled for 2009. "My mate, Brent Cook, and I were on the bridge one night looking for an alternative to Panama to get back to the Med," explains Pizzaruso. 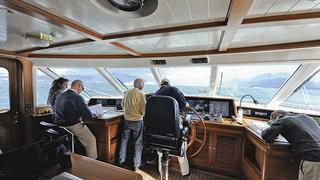 "We were trying to plan a circumnavigation, but Suez just did not appeal to anybody involved. 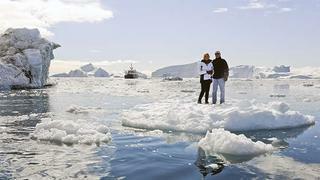 The research for the Northwest Passage trip excited the crew and the owner, and so preparations began." The crew had lined up a potential west-east transit, but delays to their approach from Japan meant they lost their weather window. Undeterred, they began preparations for an east-west attempt, and in July 2011, after some preparatory refit work at Royal Huisman's yard in Holland, Arcadia headed up the North Sea bound for Greenland. The plan was to cruise Greenland's coast for three weeks to await the optimum weather window and to use the area as a training ground to see how Arcadia would perform in challenging conditions. It was a steep learning curve. 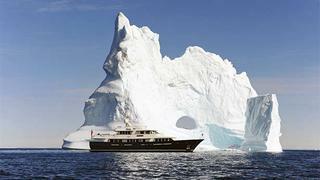 The yacht had ventured into the Arctic Circle before, but had never undertaken such a challenging voyage. She is a luxury cruising yacht constructed from aluminium with some carbon composite elements in her superstructure - not a steel-bound ice-breaker - and her stabilisers are also largely incompatible with chunks of submerged ice. In preparation, Pizzaruso added temporary floodlights to the bow. "I didn't want to risk missing something by scanning with just the searchlight," he says. "I wanted the same lights that the guys on (television series) Deadliest Catch use. Steve Figueiredo at Newport Shipyard gave us a few ideas, and a company in Holland provided the low pressure sodium lights. They proved to be very useful. "For safety, we purchased cold water survival suits, added another Iridium satellite phone to our inventory, and purchased a soft-bottom inflatable tender for rocky landings. I studied the charts and made it a point to familiarise myself and the crew with the Egg Code - the World Meteorology Organisation system for sea ice symbology - and other features on ice analysis charts. We were of the opinion that the trip was going to plan itself as conditions would favour different options as it unfolded, and that is what happened."
Arcadia also enlisted retired US Coast Guard Rear Admiral Jeff Garrett, who had done the passage as master of an icebreaker, as a guide and adviser. "We felt Jeff's experience of ice breaking could come in handy and he provided a fantastic amount of information on what we could have expected."
On September 2, the steep learning curve of Arcadia's training schedule soon flattened out to a point where captain and crew felt comfortable with their preparations and ready to take on the challenge of their attempted transit. Arcadia filled her tanks with winterised fuel and departed Qasigianguit (also know as Christianshab), Greenland, for a three-day Baffin Sea crossing to Pond Inlet, and headed into the Northwest Passage. Ice conditions were expected to be favourable, but they far exceeded expectation: the passage proved to be free of sea ice. "Arcadia doesn't have the capability of pushing through even medium concentrations of ice," said Pizzaruso. "We had agreed with the insurance company that we would not enter anything above two-tenths coverage, and I had no intention of putting the boat in a situation we would not be able to get out of."
But the icy capes and islands left no room for doubt that Arcadia was travelling in extremely high and isolated latitudes: only one other ship was ever seen. And with yachts often becoming stranded and with conditions capable of changing rapidly, the crew could not afford to be complacent. "Some of the conventional rules just don't apply up there, and what you have to do is counterintuitive," says Pizzaruso. 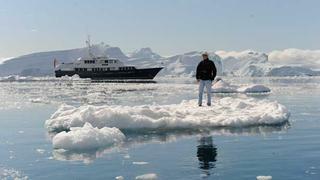 "You would expect to find shelter and security in a protected anchorage, but the reality is that ice caps can create powerful katabatic winds and steep seas just metres from the shore. Safety and security are actually to be found in the normally more exposed areas of deep, open water." 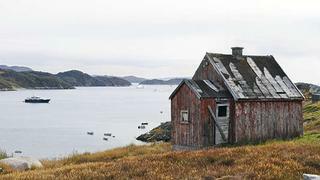 Arcadia progressed westwards by way of Devon Island, Prince Leopold Island, through Bellot Strait to Jenny Lind Island, Victoria Island and then on to Nome Island, the Beaufort Sea, Chukchi Sea and Bering Strait. Anchorages were chosen to allow owners, guests and crew to enjoy invigorating (if cold and challenging) hikes ashore where they could explore, view wildlife and visit the graves of lost expedition sailors on Beechey Island. The weather was relatively mild, 10 to 12 degrees centigrade by day on most days, and not too far below freezing at night. Occasional snow flurries were experienced along with quite fine weather, but the temperatures could drop alarmingly in the katabatic winds. On September 9, shortly after anchoring in a calm at Cape Home, Arcadia was subjected to almost 60 knots of wind and a steep, four-foot chop, just metres from shore. Fortunately, her owner had the foresight, when building her, to specify anchors, winches and ground tackle well above the norm for a yacht of her size; with the additional benefit of good holding ground, she held securely throughout. From a wildlife perspective, the passage yielded some dividends and some disappointments. Guests and crew were delighted by the number of polar bear sightings but also by the healthy condition of the bears; those seen on a previous passage to Labrador in Canada had appeared emaciated by comparison. Thankfully, a close encounter with a swimming bear proved the only pulse-raising experience. "We were manoeuvring through a patch of glacial ice chunks when a bear suddenly appeared right in front of the boat," recalled Pizzaruso. 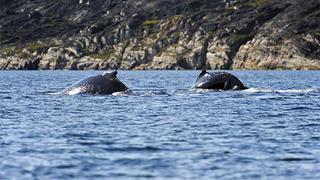 "It rolled over, looked at the boat and snarled - we narrowly missed it."
Humpback whales were regular companions but eagerly anticipated sightings of the much rarer narwhal and beluga whales did not come to pass. The best platform for wildlife sightings proved to be the yacht itself: shore parties discovered the sensitivity of both birds and mammals to their presence. Navigationally, the Northwest Passage presented only modest challenges - but that is in the context of both 21st century technology and 2011's exceptionally open waters. The compass is effectively useless so close to the magnetic pole, but GPS, radar and visual bearings ensured safe navigation through the relatively deep and steep passages. Arcadia covered a total of 3,278 nautical miles, of which 1,587 were completed between Ilulissat and Cambridge Bay, and a further 1,691 between Cambridge bay and Nome, Alaska. "The highlight was the knowledge that we had done something that only a few before us have done, and we have a great respect for those who pioneered the Northwest Passage," adds Pizzaruso. "We were very happy with how it worked out, especially after having had our 2009 attempt robbed from us."
For Arcadia's owner, the most powerful memories derived from the extraordinary sense of isolation and vulnerability at the northern navigable tip of the planet; from the sense of awe and humility that accompanied a passage in the footsteps of pioneers such as Sir John Franklin and Amundsen; from the magnificence of the scenery and wildlife; and from the recognition that this relatively small yacht could offer such comfortable and reliable access to an exceptional experience so far from modern-day human habitation. 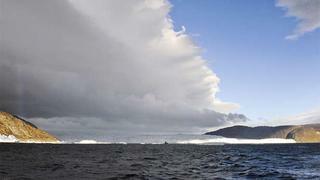 There is also the quiet pride in being the 159th vessel to complete a transit of the Northwest Passage. And she was officially credited as the 145th because each year's passages are listed alphabetically. The open waters of 2011 may have made the attempt less challenging than in earlier times, but it takes a rare spirit to even contemplate heading north into the Arctic Circle to make such an attempt.